Western Ghats has a unique identification and has hidden many more natural beauty spots in it which a common man cannot reach. Bandaje Arbi Falls is one of those places which flow all 365 days in a year. Bandaje Arbi Falls is located in Charmudi Ghat in Dakshina Kannada district, around 12km away from Ujire (near to Dharmasthala) and trek base point is Mundajje. One need to have strong determination and strength to reach this falls and enjoy the Mother Nature glory. I have a gang of 21 friends, we all decided to go for a trek to Bandaje. Our team includes 10 girls and 11 boys. All initial preparations were done. We rented some tents and started our journey from Bengaluru. On Jan/2/2015, we all gathered in Marathalli. Since we all knew each other, introduction was not required. Mini-bus which we have booked, reached Marathalli bridge at around 10.30pm.We started from Bengaluru at 11pm. We reached Dharmasthala around 5.30 am. We finished our morning routines and had a delicious Idli breakfast. Packed upma for the lunch. We reached starting point of the trek (Mundajje, Narayana Gowda’s House) at 8 am.Took guidelines from him about the trek. He is the main source of contact for all the trekkers there. He asked for the guide, we politely declined it. My friend Sachin did a kind of research about the trek, paths should be followed and all. He even had a printout of trial to be followed in the forest. Mr.Gowda gave the contact number of the guide Sanjay in case of emergency (who already took a team towards the falls). 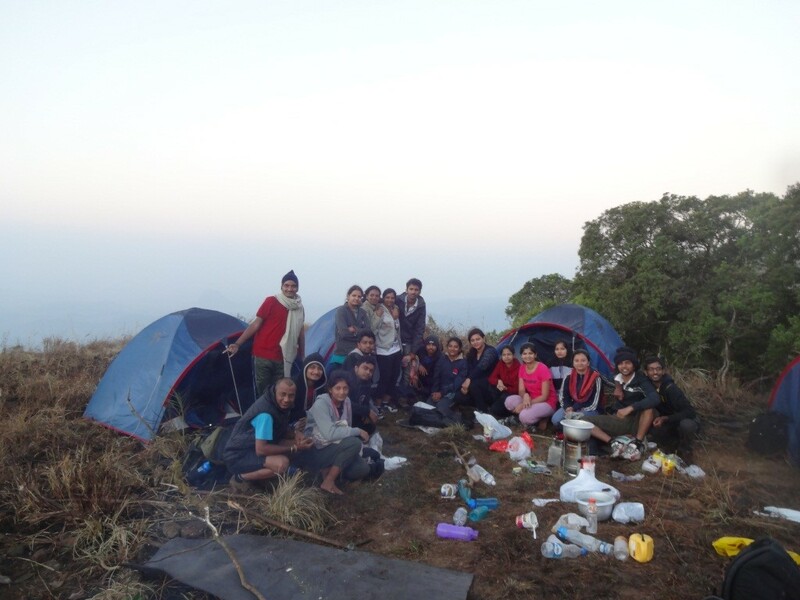 We thanked Mr.Gowda and started our trek at 8.30 am. In the beginning only our teams guide (our team member) Mr.Sachin gave few instructions which are to be followed during trek. He even told us to walk with a stick in hand. It helps in balancing and even to check for snakes that may be hidden beneath the fallen leaves. In the beginning, everyone was very enthusiastic and the trek didn’t seem so tough. As the time passed, we entered into the forest later we got to know that the trek is not going to be as easy as we thought. We had to ascend many steeps (steep was almost 60 degrees!!). We took small breaks here and there and clicked some snaps in between and reached stream at 11.30am. Till the stream, the trail was clear; there was no chance of losing the path. We followed the trial. The stream water was so cold that we didn’t have the courage to play in the water. (Even due to leeches too). We crossed the stream and walked for another 10-15 mins. And there comes the unexpected thing. We lost the path!! We all sat in one place and was taking rest, Meanwhile, few boys of our team went in search of the path. At that place, another team of 6 members also lost the path and reached us. All felt hungry, and we had our lunch (upma) which we took parcel. Finally, our boys did find the path. And we started our trek again. It was a dense forest, Sunlight could hardly reach the ground. Even at 12pm it was dark. Our stamina started decreasing. We took energy drink, apple, orange, chips and biscuits with us. Energy drink helped us a lot. Our pace was slow; we had to reach grasslands at any cost before evening, bcoz we can’t camp in the middle of the forest!! Time was already 2pm and we were hurrying. Finally at 3pm we reached the end of the forest and entered grassland. At the entrance of grassland, we took half an hour break. There we met the guide Sanjay who came with the other team. They were already descending. Then after the break we started again. Although we entered grassland the journey wasn’t easy. Here also we have to climb and the sun was cruel. In the hot sun, our journey continued with small breaks in between. 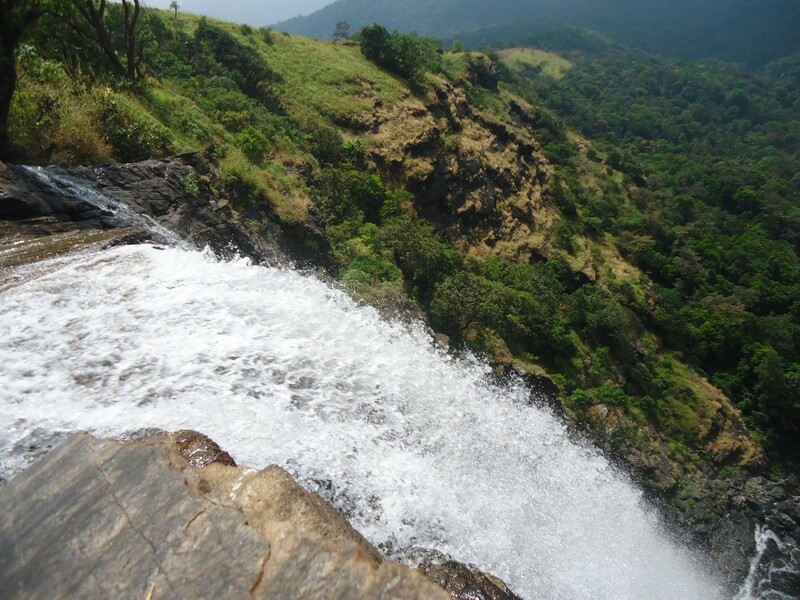 After few minutes of the journey in grassland, we encountered the view of marvelous Bandaje falls. This gave some energy for all of us to reach d peak. At 5.30 pm, we reached the peak. As no one was there at the top we needn’t struggle to find the place for erecting the tents. We did camping near the stream. We all got fresh up in the stream. Our team boys started building tents. Within half an hour, five tents were ready. We also carried small charcoal stoves with us. We lit 2 charcoal stoves and prepared soup, yummy. After that, we even thought of preparing rice. But all were tired, so we ate cup noodles and finished dinner which was a kind of moonlight dinner.We arranged for the fire camp and chitchatted for few minutes. After that everyone went to sleep. Boys decided that two guys will be awake and look after the fire (for safety purpose and Protection from wild animals too).Accordingly two boys at a time did their job. Although we were so much tired we couldn’t sleep due to the heavy cold. From the starting point of the trek till the peak we covered a distance of 15km! Our day started at 6 am. Sun was yet to rise. All woke up and finished our morning routines. We prepared and had hot tea which gave a warm feeling in cold weather with bread and jam.After that, we prepared rice and mixed it with puliyogare mix and ate puliyogare with some chatnis. By that time, few of our team members traced the route to reach the edge of the falls. We all reached the edge of the falls. The very first sight of the falls was just amazing. No words to explain that. Lying down beside the falls and to watch the stream falling down hundreds of feet n flow along; WE NEED A STRONG HEART. One by one we enjoyed and filled our eyes with the scenic beauty of the mouth of the falls. I felt as heaven is just here, in front of my eyes. All our tiredness vanished by seeing the very mesmerizing falls. We played in the water for some time. Clicked some single and group pics and returned to the camping site. Then we packed our luggage and started our journey towards Ballarayana fort. The time was 3pm. From the camping site towards the fort also, the journey was ascending. The difference here was, we will be walking in the grasslands. Last few km to the fort was very difficult, we reached the fort at 5pm. The distance covered from peak to the fort was around 6 km. We ate bread and jam there. We took the water from the house; the man gave water for few bucks. 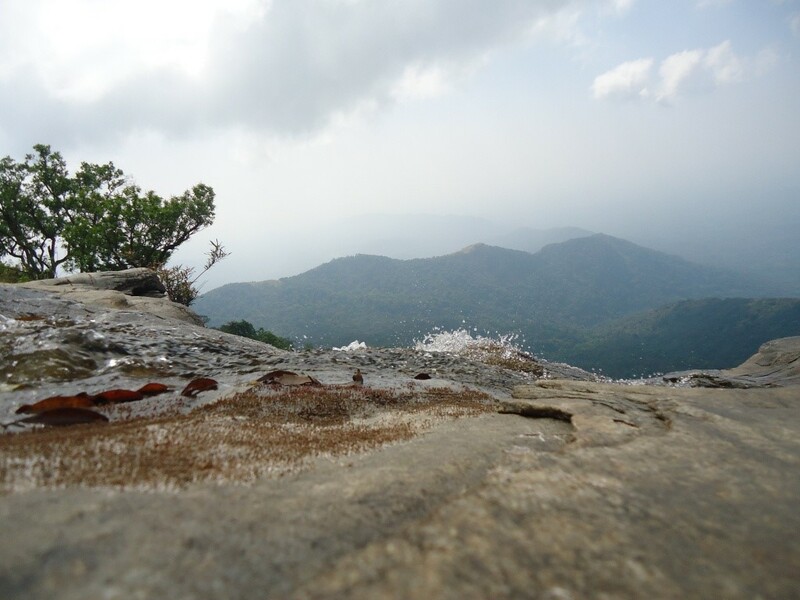 And then from there to reach the trek end point:sunkasale we just need to descend. We started walking down. It’s just 3km. By the time we reached the end point our bus driver was already waiting for us. The moment we reached end point the Western Ghats echoed with our chorus ‘We did ittt’. Time was already 6.30pm. We all settled on the bus and started towards ‘Horanadu’. Horanadu is just 14km from Sunkasale. We reached Horanadu at around 8.30, took maata ‘Annapoorneshwari’ darshan, had prasad and left from there at around 10pm. We reached Bengaluru by 6.30am. It was an awesome trek, lifetime achievement. Literally to say, we just climbed the charmudi ghat from one base point and reached the other side of the base point. Thanks to my friend Sachin for organizing the trek. Thanks to all the boys in our team for carrying such a heavy bags (tents, stove). Thanks to all the gals of our team for being always enthusiastic and lively. And thanks to my friend Mr. Karthik for editing the article and encouraging me throughout the journey.